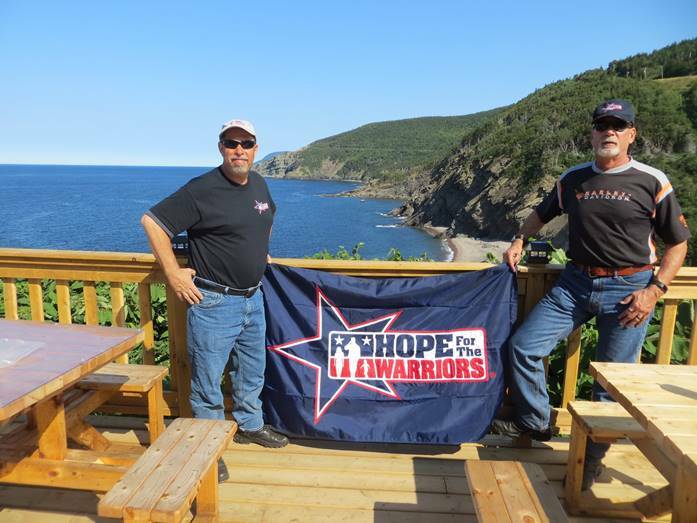 Air Force veteran Michael Nehlsen and Jeff Molesko during the 2017 Ride For Warriors in Nova Scotia. HILLSBOUOUGH, N.J. (May 21, 2018) – The Fourth Annual Riding For Warriors 18-day motorcycle ride will kick-off May 24 in Somerset County, New Jersey benefiting Hope For The Warriors and its A Warrior’s Wish program. Celebrating 11 years of service, Hope For The Warriors is a national nonprofit dedicated to restoring a sense of self, family, and hope for veterans, service members and military families. Through its first established program, A Warrior’s Wish, Hope For The Warriors fulfills a desire for a better quality of life or supports a quest for gratifying endeavors for those who have sustained physical and psychological wounds in the line of duty. For the fourth year, the ride will be led by Air Force veteran and Hillsborough-based Michael Nehlsen and sponsored by Union, New Jersey-based Hillmann Consulting. Again, joining Nehlsen on the more than 4,700-mile Southern journey is Jeff Molesko, also from Hillsborough. The 18-day journey will take them south through Pennsylvania, Virginia, Tennessee, Oklahoma, Texas, Louisiana, Mississippi, Alabama, Florida, Georgia, South Carolina, North Carolina, Virginia, Maryland, Delaware, ending back home in New Jersey. With a goal of $25,000, Nehlsen and Molesko are raising funds to sponsor the A Warrior’s Wish program. In addition they will honor all military members who have served, and on Memorial Day, will memoralize those who have died in action. Nehlsen shares why he and Molesko embark on this ambitious journey each year. In three years, the proceeds from Riding For Warriors has sponsored 14 wishes through A Warrior’s Wish totaling more than $91,000 providing wounded veterans with woodworking and farm equipment, family trips, a saw mill, a horse trailer, a bass boat, four road bicycles and more. For more information on Riding For Warriors or to make a donation, visit hopeforthewarriors.org/Riding4Warriors2018. For more information Hope For The Warriors or its A Warriors Wish program, visit hopeforthewarriors.org, Facebook or Twitter.